Imprint a beautiful pattern on your fondant cakes in less time than it takes to decorate a cake! Wilton Fondant Imprint Mats make it easy. 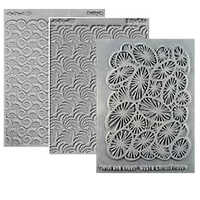 Simply press and roll metal clay or polymer clay across the surface of the texture plates to provide patterns and texture. Plates are two-sided for indented or raised patterns. Each clear, reusable plate is 5 x 4-inches. Patterns can include wood grain, cobblestone, flowers and more. Texture maker ini digunakan untuk membuat motif emboss diatas plat metal tipis, atau diatas clay (Artclay, PMC, Polymer clay) dll. Untuk Clay : tinggal tekan / roll clay yang masih basah diatas Texture maker ini. Untuk Metal tipis : anda harus menggunakan alat embosser / stylus untuk menekan / menggosok plat tipis anda keatas Texture maker ini. Terbuat dari High Quality plastic yang heavy duty serta mempunyai detail texture yang dapat menghasilkan emboss yang tajam. These texture sheets are a quick way to add textures to your clay projects. Includes 4 sheets per package. Each sheet is a different pattern. Many sets of sheets available! These texture stamps come in a variety of unique patterns. Each is extra deep to give highly detailed results for both dimensional design and surface imprinting. Each stamp comes unmounted for optimal usability. Enhance your stamp design with foils, stamp pads,embossing powders or ultra thick embossing enamels. Ideal for clay applications including: Textile Effect, Mica Shift,Patterned Dichroic, Sutton Slice, Faux Tapestry Techniques, and much more! Extra deep to give highly detailed results. Great for dimensional design and surface imprinting. Quality rubber material used to ensure durability and heat resistance. Enhance your stamp designs with foils, ink pads, embossing powders or ultra thick embossing enamels. Ideal for clay applications including: Textile Effect, Mica Shift, Patterned Faux Dichroic, Sutton Slice, Faux Tapestry techniques, and much more. These sheets are just chock full of images! You'll have fun playing with them for your polymer, metal clay or paper creations!! These plastic textured plates are used to make texture on paper, textile, clay etc. Just slide one the embossed patterns beneath drawing paper or textile, and rub crayon or pencil or "pain stick" over the area you want textured. Can be used for clay also, just press these texture sheet on your clay sheet. Sold in a "Set of 6 different plates" each plate is 21.6 cm × 28 cm. The details in this texture sheet are deeply etched, then molded onto a rubber sheet to ensure clear, crisp impressions in your metal clay. Coat the sheet with an anti-stick (mold release) for defect-free release. This large-size sheet provides nearly 60 sq. in. of textures for you to choose from. In addition to a full set of stylized lower-case letters, the sheet contains a whimsical 7" x 7" free-hand scene bursting with chrysanthemums, butterflies, hearts and other design elements—including customizable blanks ideal for stone-setting and an endless variety of other imaginative uses.